The Iron Brigade, served out their enlistment entirely in the Eastern Theatre. 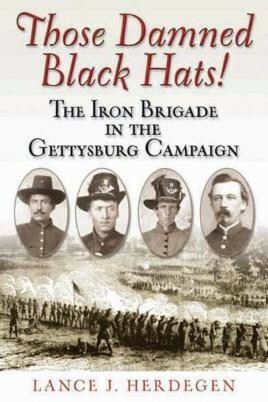 These soldiers from Indiana, Wisconsin, and Michigan, who waged war beneath their unique black Hardee Hats on many fields, from Brawner's Farm during the Second Bull Run Campaign all the way to Appomattox. Unfortunately, due to sales rights restrictions, we cannot offer Those Damned Black Hats! for sale in your country. The Iron Brigade, served out their enlistment entirely in the Eastern Theatre. These soldiers from Indiana, Wisconsin, and Michigan, who waged war beneath their unique black Hardee Hats on many fields, from Brawner’s Farm during the Second Bull Run Campaign all the way to Appomattox. None of these battles compared with the “four long hours” of July 1, 1863, at Gettysburg, where the Iron Brigade was all but wrecked. Military historian Lance J. Herdegen’s work is the first book-length account of their remarkable experiences during that fateful summer of 1863. Drawing upon a wealth of sources, including dozens of previously unpublished or unused accounts, Herdegen details for the first time the exploits of The Iron Brigade, the Western troops stood line-to-line and often face-to-face with their Confederate adversaries, who later referred to them as “those damned Black Hats.” The Brigade shed copious amounts of blood to save the Army of the Potomac’s defensive position west of town. Their heroic helped define the opposing lines for the rest of the battle and, perhaps, won the battle that helped preserve the Union. Award-winning journalist Lance J. Herdegen is the former director of the Institute of Civil War Studies at Carroll University. He previously worked as a reporter and editor for the United Press International (UPI) news service covering national politics and civil rights. He presently is an historical consultant for the Civil War Museum of the Upper Middle West.